Introduced as a supplement to the iPhone’s address book, Contact Tool is an iPhone app designed for sorting, finding, and organizing your address book. Alessandro Levi Montalcini’s $2 app combines an advanced search mechanism along with a set of filters to help complete the job. 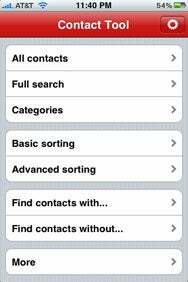 Making Contacts: The search mechanism in Contact Tool is much more extensive than what you’ll find in the iPhone’s built-in Contacts app. Within Contact Tool, there are two methods of finding contacts—searching or using a built-in filter. The search mechanism is much more comprehensive than the iPhone’s built-in Address Book, as it searches through notes and related names. Filtering is done by using the sorting menus, either basic or advanced. Under basic, such options as company, e-mail address, first name, job title, nickname, and department are available. Age, birthday, ringtone, phone number, location, and URL are all options for advanced sorting. Contact Tool also allows you to to find contacts with or without specific information. For instance, you could find which entries are lacking an e-mail address. There are also many menu layouts available for customizing the user experience. Menu layouts function by replacing the default menu, or screen, with related and relevant options. For instance, a business mode displays the companies, people, department, and address filters. The other menu layouts are browse, full, and inspect. A statistics panel in the settings menu allows you to see percentages and raw numbers regarding how many of your contacts have certain information. Settings also displays many color themes for changing Contact Tool’s style. Finding contacts is fairly easy using the numerous methods in Contact Tool. However, the app shows a brief actions menu for a contact and forces you to click through to see the full information, instead of just taking you to the full contact, as most other address book apps do. You can edit contacts from within the app, but not add or delete them. While the developer says that this was done on purpose so as to not mimic the built-in contacts app, some users might find it frustrating if they want to make Contact Tool their default address book. Otherwise, Contact Tool has very few flaws. For managing and editing your address book, Contact Tool is a strong alternative to the built-in iPhone app. You’re still going to need the standard Contacts app for adding and deleting entries, though. Still, Contact Tool’s sorting and searching capabilities make it a good addition to your mobile device. Contact Tool is compatible with any iPhone or iPod touch running the iPhone 2.1 software update.